The Salt Lake 2002 Olympic Torch Relay was launched on December 4, 2001 in Atlanta, the site of the last Olympic Games in America. This began a 65-day, 13,500 mile journey through 46 states with 11,500 torchbearers. 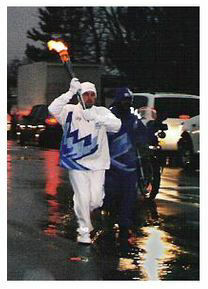 The relay culminated on February 8, 2002 with a grand entrance into the Opening Ceremonies at Rice Eccles Stadium. The Torch Relay traveled through approximately 300 cities with virtually every local network and print media outlet covering the event. Coverage of the relay included approximately 10,000 national and international print articles between September 2001 and the conclusion of the Torch Relay on February 8, 2002. Coltrin & Associates, together with SLOC, developed messaging to highlight the theme of the Relay and the Games “Light the Fire Within”. Coltrin & Associates drove the outcome of the media coverage by directing the focus to the inspiration of the torchbearers. This was done through daily advanced briefings, media advisories and interviews. The media relations team for the Torch Relay was comprised of seven Coltrin & Associates employees located on the road and at the main media command center in Salt Lake. The staffing made it possible for a spokesperson to be available at any given time.